Food Supplements are intended to fill the nutritional gaps created by foods that are depleted of many essential nutrients. Many people today are taking them either daily or occasionally. These products range from minerals, proteins, herbals, vitamins to many other varieties. Yet as you might have realized, it can be extremely difficult to eat these healthy foods that the body needs to function normally. We at times have poor food choices. And when we select healthy foods, these food are do not have all the nutrients they ought to probably due to processing, poor harvesting methods and transportation as well. All these leave us with nutritional gaps that can affect our health negatively. If you realize that you are not eating a healthy diet, consider supplementation so that your body does not miss essential nutrients which might pose a health risk. However, remember that any supplement should never replace food. It should always be your priority to take a healthy balanced diet. Research has established that a supplement can benefit your overall health in managing certain health problems. For instance, vitamin D and calcium ensure that your bones are strong. Folic acid is known to reduce chances of some birth defects. Omega 3 fatty acids are very helpful in preventing and fighting heart disease. The Role of Food Supplements? They provide us with nutrients that are important for healthy living and well being. They give us necessary nutrients so that our bodies are free from any deficiency signs. They also provides the body with what it requires to thrive ans survive in every environment that we are in. Vitamins are classified as organic elements that must come from dietary sources. You need vitamins to stay active since these elements are required by every organ in the body. Taking excess quantities of vitamins can harm your health, this might damage your liver among other body organs. Individuals exposed to pollutants require extra vitamins. This also include individuals who drink excess alcohol and cigarette smokers. 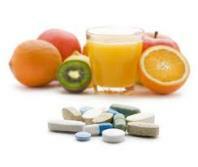 Am example of vitamins is vitamin A, Vitamin C and vitamin B-12 . Minerals consists of non-organic elements present in body fluids and tissues. These include blood, bones, teeth, liver, and nerve cells among others. The body has approximately 60 types of minerals. 22 of these are essential for optimal health. Minerals are substances that the body cannot produce. Therefore they must come from our dietary sources. There are many botanical and herbal supplements on the market today. Herbs and botanicals come from leaves, roots, stems, seeds and flowers. Many herbals and botanicals have a reasonable background of human health benefit. However you always should choose wisely. Amino acids are the building blocks of proteins, and approximately three to fourths of the dry weight of every cell in the human body is protein. Not all amino acid products are safe for you. Some can interfere with the balance of the 22 amino acids in the body. Consumed proteins are taken into separate amino acids. These are then combined into protein chains which makes you to have a healthy skin, and also creates hormones, muscles, body organs and tissues. When you increase your protein intake through foods or supplementing, you help your body to replace proteins and repair the body tissues that are damaged when exercising. Some of these food preparations can have active ingredients which can pose a health risk. For instance, vitamin K is known to reduce the capability of the blood thinner to prevent clotting. You therefore ought to be alert when buying them and especially newly introduced ones that are not well known. When you take more that you need will eventually result to a health risk. Seek your doctor's advice if you are on medication. Some can react with medicine and cause some side effects that might harm your health. Let your health physician advice you if you can combine them with your prescriptions. If a supplement is taken before or after surgery, it might affect an individual's response to anesthesia.